Select the File system indexing option with the Tab and Down keys and press Enter. The File system indexing option is available if Veeam Agent for Linux operates in the workstation or server mode. Select Index everything except if you want to index all files within the specified backup scope except those files that reside in specific directories. Enter paths to directories whose files you do not want to index. To separate several paths, use the ',' (comma) character. 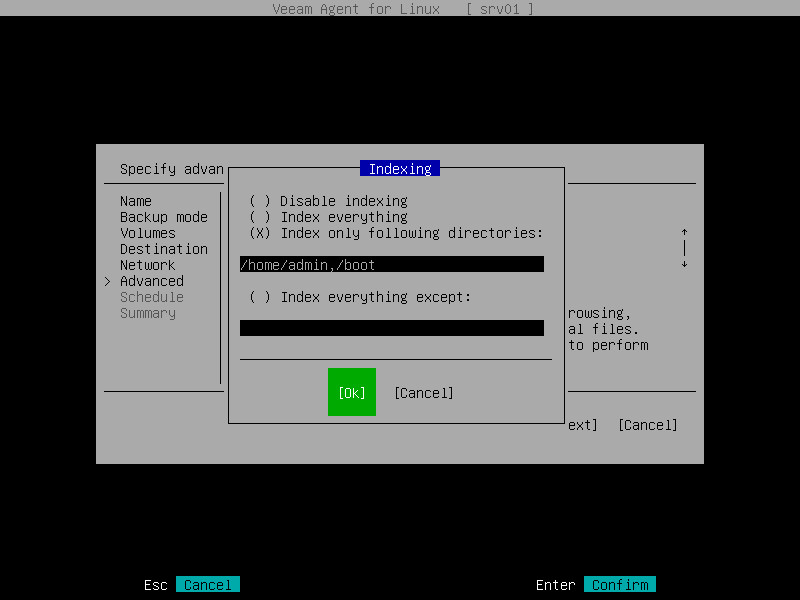 Select Index only following directories to define directories that you want to index. Enter paths to the necessary directories. To separate several paths, use the ',' (comma) character. Switch to the Ok button and press Enter.